Every year, our House sees a spike in family emergencies during the holiday season and what’s supposed to be a time of togetherness gets marred by separation and uncertainty. It takes a community of partners – from our friends at McDonald’s to the media who helps to tell our stories to those companies who help us further our reach in the community. Quite literally, it takes a village to help us keep families close. Dillard’s is once again selling its annual Southern Living Cookbook, donating proceeds of the $10 book to RMHC to help us keep families close over the holiday season. By purchasing a copy, you’re not only giving fun to the recipient (whether that’s someone on your list or yourself), but a home to another family so they can stay at their child’s side during his or her hospitalization. With just $10, you can provide them with one night at the House. To show just how important these partnerships are for families who need our House, we came together to prep a very special recipe. A collection of staff, volunteers and even some House guests baked a recipe from this year’s Southern Living Holiday Cookbook (available now at Dillard’s) to gift. 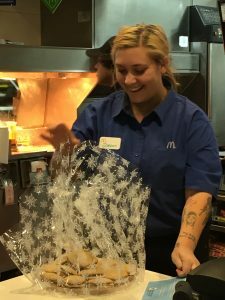 We surprised some of the nurses at Saint Mary’s, the newsroom at Reno’s KOLO 8 and some of our friends at a nearby Reno McDonald’s restaurant. A giant shout-out to Jerick Image for creating such a fun video on our behalf! We quickly learned it’s just as much fun to give back to our supporters! It’s hard to watch as families struggle through tough times, but you don’t have to be helpless. Whether you’re putting a smile on the face of a loved one or a family in need, these cookbooks are a meaningful way to give back and help our House this holiday season. Get yours today, share some fun shenanigans with people in your life, and help keep families close in the process! And that’s it! Help us keep families close this season and spread the word. Contest ends December 22nd. Janessa Holman has contributed 6 entries to our website, so far. View entries by Janessa Holman.